Material Obsession: what to do first? I have taken to the habit of waking up in the morning and sitting at my computer to download my "jobs" of the day. They seem to accumulate over night as my brain rests and ideas are born. Upon rising there is a sense of urgency to get to the variety of items. Lately it seems the list has been crowded with options calling for my attention as the sight of my desk would indicate. Honestly. What kind of human am I that this is what I wake up to today? See that big coffee cup...that is the key. I wish sometimes that the list was shorter and I didn't wake up with a start and a jump to my feet but, such is life. On Saturday I had the absolute pleasure of addressing the NSW Quilters Guild. We packed up the shop and headed to the Burwood RSL for the day. The shop stall was busy while Wendy and I did a demo on our new template program. 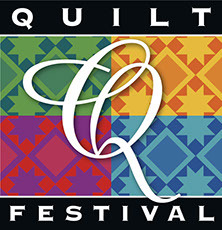 Then we attended the General Meeting which was full of quilty news of local events...including the up coming show in June and a great new program for young quilters. After the meeting we heard a retrospective talk by Isobel Lancashire about her 30 year experience with the guild. It felt a bit of a trespass to follow her heart moving memoire. I gave a talk on my quilting experience. At 4am when I had gotten up in sleepless frustration to read my notes they were in perfect order so I left them at home. Not intentionally mind you, but in a flurry of packing up stuff. Where was my list that morning one might wonder? Anyway, fully practiced I think I remembered most of it on the day. The shop has been very active the last few weeks. Plans and lists don't get much attention when there are people around and we are working on their quilts. Last week Kaye brought in her Soul Searching quilt from the colour workshop we did with Reece. Evidence that she worked hard and fast! Kaye told me that her husband who works in supplying interior design wall products got in on the act of working the colours of her stash. Sounds fun actually. Anyway, well done to Kaye who by all estimations has worked hard here. Speaking of working hard I have to toot this Wendy's horn. Quietly and without the bustle of noise that I make, Wendy goes about her day accomplishing great things. Here she is in action yesterday in the technique workshop. Eager quilters got a mindFUL of creative options here. Within a few minutes this space and the rest of the room was full to brimming with fabric and shapes coming to life for all kinds of projects. Wendy's new project for classes has lots of options built into it. We have a great new line of wool that is flying out the door and getting a workout in lots of new projects. She comes loaded with ideas and samples of techniques. I mean loaded. There is no holding back here. Her ideas are shared with everyone which opens the door to creative expression...our favourite theme. It is hard to decide where to start but start they did. Creative options abound. Even with the wedge ruler, just when I thought she had exhausted everything that could be done with one, this apeared. Lee was in Wendy's class last year and made this over the summer. The method came from Bari J Ackerman (who by the way is now with one of our favourite fabric companies ART GALLERY!!!). Flowers are morphing onto everything now. Of particular interest was Lee's outfit and pillow which all worked together. When I think of yesterday and the Garden Party workshop the day before I get really excited. I didn't have my camera with me on the weekend or Monday and it is frustrating not to be able to show you all the fun things that were going on. Garden is the theme of the day. It allows for much individual expression. There are so many new methods of construction and so many new fabrics to play with or mix with the old. Lots of these ideas are great for stimulating the stash. Queen of the May or raw edge, there is no limit to the list of fun things to do. One of the great pleasures of the shop is watching people get more and more involved in their quilting experience. Deidre picked up this quilt done in pastel Kaffe fabrics the other day. 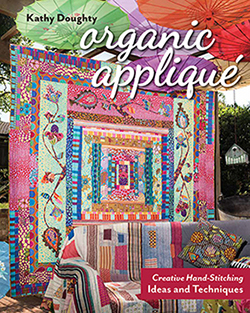 Deidre is one of those quilters that is taking it seriously, moving wisely through her options and growing all the time in her adverture with fabric. We all start somewhere but it is wonderful watching where we all end up. There is so much to do and it is all FUN!!!! What's up next? 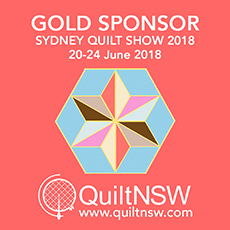 Well a bit about the Under 35's competition being sponsored by the NSW Quilters Guild, Brother and me. Are you under 35? Do you know someone who is that you want inspired to quilt and to share the glory of colour and design???? I am sure you do. Send them our way and we'll get them started on a fun Garden Theme project for the show in September. 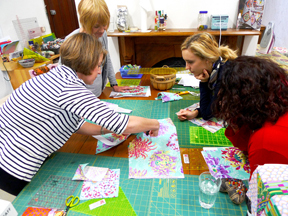 What could be better than being responsible for getting a young person quilting? Come on! Thanks Kathy for your part in a great day at the Guild's Burwood meeting. I loved your talk and seeing photos of your quilts amongst the Aussie landscape was such beauty. I bought your feathered star templates and went straight home to audition my fabrics. Yet another thing to add to MY super long list of things to do. Well I was one of the lucky ones at Burwood too! Such a privilege to hear your talk and absorb your enthusiasm and see your creative journey. Great photos... your new book will be awesome. Success is need a lot of hard work that can be realized. I like the style. I also like writing something if my spare time. So I can learn something from your article. This site really has a nice and complete information,good work! If you are warned that a wildfire is threatening your neighborhood, listen to your radio for reports and evacuation information.